Whole Grain Apple Waffles - Do You Know The Muffin Man? Notes: I used goat's milk yogurt and wasn't able to detect its flavour; I also grated the apple instead of dicing it. 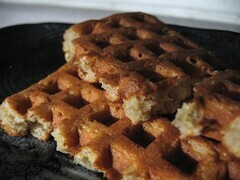 These were fantastic, full of flavour and low-fat (unusual in a waffle) to boot. Big Al thought the stone-ground cornmeal I used could have used some toasting. A definite winner; maybe waffles are one of those things that can be easily adapted to be gluten-free without any significant compromises.